Most Tennesseans are familiar with the striking yellow and black plumage of the male American Goldfinch. However, in winter its plumage is so different that many people don't recognize it as the same species. Goldfinches are unusual in that seeds make up a large part of their annual diet, and as a consequence, they do not start nesting until July when more seeds are available to feed the young. American Goldfinches are a common year round resident in Tennessee. In winter they forage mainly in flocks and frequently visit birdfeeders. The breeding range extends across southern Canada and the northern two-thirds of the United States, and in winter they are found across the continental United States, and into Mexico. Description: The male in breeding plumage (March-October) is bright lemon-yellow with a strongly contrasting black forehead, wings and tail. The breeding female is olive above, dull yellow below, with blackish tail and wings, and two pale wing-bars. During the non-breeding season (October-March) both male and female are a dull, unstreaked brown, with blackish wings and two pale wing-bars. The male usually has more yellow in the face and on the shoulder. The bill of breeding season birds is pinkish and gray during the non-breeding season. Voice: The song is a variable series of musical trills and twitters, often interspersed with a bay bee phrase. The distinctive flight-call is described as sounding like potato chip or per chick ory. Pine Siskins have streaking on the back and chest, and the yellow is confined mostly to the wings and tail. They are sometimes found in flocks with goldfinches in the winter. 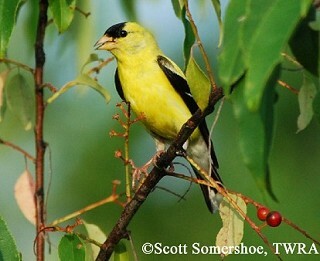 Habitat: American Goldfinches breed in weedy fields, fencerows, woodland edges, orchards, and gardens. They winter in weedy, open areas, and move into urban and suburban areas to eat at feeders. Diet: Seeds, especially of composite flowers like dandelions, sunflowers, and thistle. They eat few insects. 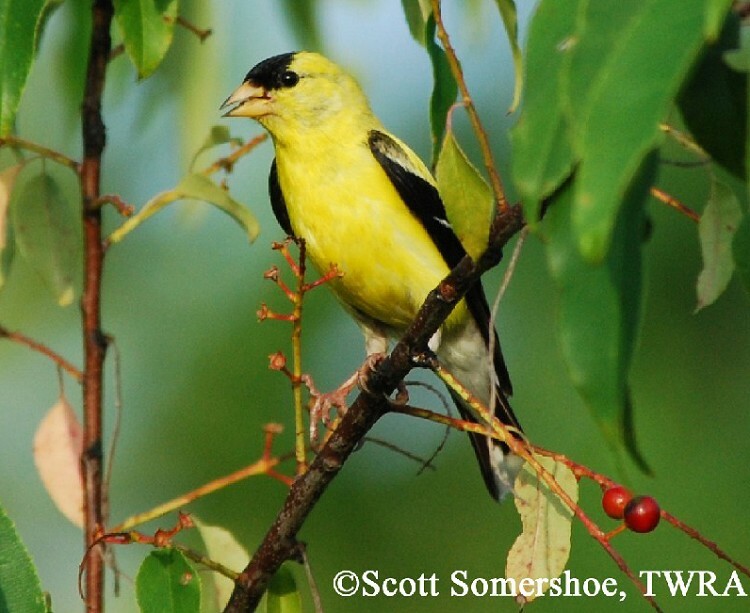 Nesting and reproduction: The American Goldfinch is the latest nesting species in Tennessee. It normally starts nest construction in July and egg laying extends from mid-July into September; females occasionally raise two broods in a season. Goldfinches tend to nest in loose aggregations with the male defending only a small area around the nest. Clutch Size: The range is 3 to 6 eggs, with an average of 5 eggs in Tennessee nests. Incubation: The female incubates the eggs for 12 to 14 days. She is often fed by the male, who regurgitates food into her mouth. Fledging: Both adults feed the young. Chicks usually leave the nest in 13 to 15 days. Nest: The female does most of the nest building. The open cup-nest is constructed of fine plant fibers, grasses, and down from thistles or cattails, and lined with plant down. It is placed in a small shrub and lashed to branches with spider silk. Nest heights in Tennessee range from 3 to 25 feet above the ground, with the average being 7.5 feet. Status in Tennessee: The American Goldfinch is a fairly common year round resident in Middle and West Tennessee, and somewhat less common in the East. Numbers increase during the winter when more northerly breeders join the resident population. American Goldfinch populations appear to be stable. The American Goldfinch changes from its winter plumage to its breeding plumage through a complete molt of all its body feathers. It is the only member of its family to have this second molt in the spring; all the other species have just one molt each year at the end of the breeding season. The American Goldfinch is gregarious year round. In winter, they are found almost exclusively in flocks of varying size. In the breeding season it often feeds in small groups. The American Goldfinch is mostly monogamous, but a number of females switch mates after producing their first brood. The first male typically takes care of the fledglings while the female goes off to start another brood with a different male. Best places to see in Tennessee: American Goldfinch are most common in Middle and East Tennessee. They forage in flocks during the winter and frequently visit bird feeders, especially thistle seed feeders. Middleton, A. L. 1993. American Goldfinch (Carduelis tristis), The Birds of North America (A. Poole and F. Gill, eds.). The Academy of Natural Sciences, Philadelphia, PA, and The American Ornithologists' Union, Washington, D.C.